It's almost Spring. Soon the snow will be melting & the Crocus, Daffodils, Tulips & other Spring flowers will be peeking out. Look for some at the Shop. I planted bulbs last Fall & I'm anxious to see if they survived the Winter. 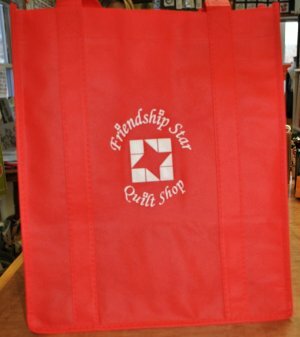 We wanted to remind everyone that this year's tote bag for The Tote Bag Program is Red. If you spend $100 in one transaction, you will receive a Red Tote Bag. Bring the tote bag in when you shop until December 31, 2015 and you will receive 10% Off all non sale items (except handmade and consignment items). You, however, cannot use it with Customer Reward Coupons, Clearance or Sale Items. You must bring the bag into the shop to receive your discount. This is an in store promotion only. To kick off March and to say a hearty "GOODBYE!" To February. 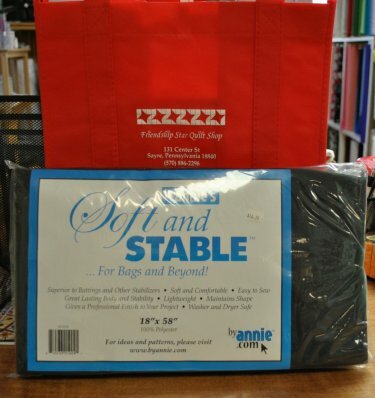 The first week of March (March 2-March 6), when you spent $125.00 in one transaction you will receive a Red Tote Bag and 1 black Annie's Soft and Stable. Soft and Stable is extra thick batting for handbags and totes. The extra thickness helps your bag to keep it's shape even after washing. It's washer and dryer safe, light weight and gives you better stability so your bag doesn't loose it's shape. Don't miss out on this limited in store time offer! Wow! Mom's really ready to celebrate the end of February! It was even too cold for me some days and I have thick Husky fur! That Soft and Stable stuff sounds like it would make a great doggie overnight bag. When I spend the night with Grandma or my friend, Karen, it would be great to keep my toys, treats and food in. Especially, the treats. I see on the big label they have free ideas and patterns on their website. That sounds interesting. I'd check it out but since I can't sew, I'll let you folks check out the website for some cool ideas and patterns. I had lots of fun running through the snow this winter but I'm ready for it to get warm so I can have my wading pool filled. Even with my big snowshoe feet, I keep falling through the snow crust. It was scary, then fun at first. Now, it's just plain annoying. I'm walking or running along and suddenly, Whammo! I fall through the crust and trip. Then I get snow up my nose. That makes me sneeze. Did you know we got some great fabrics in last month from Northcott, Moda, Quilting Treasures, & Quilt Gate to name a few. The Shop is full of bright new colors and we even got this nice fabric with little hummingbirds drinking out of flowers. We have pansies, lilacs and blue bells, too! It sure is starting to look like Spring in here! We have more flower fabric coming in March and some Northcott's Sandscapes is coming, too. Spring is on it's way, it's time to make something with some bright colors. We still have some nice fabrics on clearance to choose from. To kick off March, I've got 25% Off Green, Orange & White fabrics to celebrate St. Patrick's Day and 15% Off Florals and Jelly Rolls. These will be the Specials for the week of March 2nd. There is also our unadvertised Daily Deal, too. We hope to see you in the Shop real soon. I need my ears scratched. Remember: What happens in the Quilt Shop, stays in the Quilt Shop.